Home » Posts Tagged "Vintage fashions"
Seen on Scene 9. 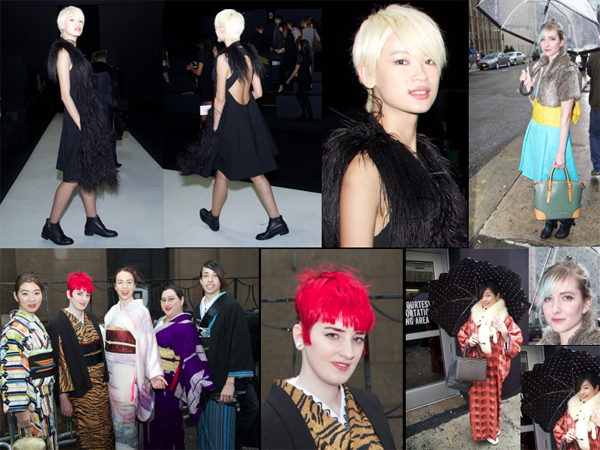 Vera Wang has her fans, shown in this photo collage wearing vintage Wang and vintage fashions influenced by Asia to see her New York Fashion Week Show for Fall 2016 on a rainy day. Top Left to Right : First 3 photos, Fab Fashionista wearing gorgeous vintage Vera Wang with a flattering short blonde hairstyle … Eileen Stall, Technology PM, and fashion enthusiast into Japanese Obi dresses and Kiminos, wearing a Hana Haba Obi Dress, a vintage sash and pale blue in her hair.